This is a Heuchera. americana hybrid and Heuchera Blondie has large yellow flowers a caramel to orange foliage. With some of the best flowers on any Heuchera, this is a standout garden plant. 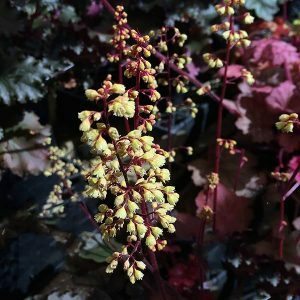 It is the flowers that are the real attraction, along with the colourful foliage this Heuchera Blondie a good highlight plant in a shaded position. An evergreen perennial with the flowers rising above the foliage on tall stems. Use Heuchera Blondie tin a shaded position where you are looking for an easy care plant that will add some colour. It is low growing, so can be used in the front of a shaded border, or mass planted to good effect. Also suited to growing in containers where it can be used to underplant taller shrubs. Heuchera Blondie is available for sale from the following participating nurseries.